Xenri no Tsuki is one of my favourite places to have authentic sushi. It’s a small restaurant that is rather unobtrusive but I haven’t been disappointed a single time I go there. That’s quite a feat seeing as I go there pretty much every month. 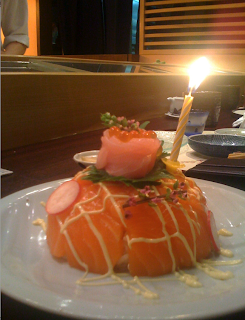 That’s probably why Chef Andy created a sushi birthday cake when I took a friend there to celebrate his birthday the other day. I apologise for the poor photo quality but we were rather eager to sample the ‘cake’ and it seemed more imperative to consume it than to take good pictures, a fact which I now regret deeply. If you do go, be sure to ask for the seared engawa sushi (the fin of a flounder) besides the usual suspects of uni, toro, kampachi etc. The only item that I am not quite satisfied with is ikura as they like to marinate the ikura beforehand and I prefer to have it plain. Other must-try items include their home-made ice-cream. I’ve tried shiso ice-cream and Chef Andy was telling me how he’s experimenting with toro ice-cream. Now that is something on my to-do list.